Coffee House Press, 9781566892391, 613pp. Dazzling and ambitious, this hip, multi-voiced fusion of prose, playwriting, graphic art, and philosophy spins an epic tale of America's struggle for civil rights as it played out in San Francisco's Chinatown. Divided into ten novellas, one for each year, I Hotel begins in 1968, when Martin Luther King and Bobby Kennedy were assassinated, students took to the streets, the Vietnam War raged, and cities burned. As Karen Yamashita's motley cast of students, laborers, artists, revolutionaries, and provocateurs make their way through the history of the day, they become caught in a riptide of politics and passion, clashing ideologies and personal turmoil. And by the time the survivors unite to save the International Hotel--epicenter of the Yellow Power Movement--their stories have come to define the very heart of the American experience. Heralded as a "big talent" by the Los Angeles Times, Karen Tei Yamashita is an American Book Award and Janet Heidinger Kafka Award winner. A California native who has also lived in Brazil and Japan, she is Professor of Literature and Creative Writing at the University of California-Santa Cruz, where she received the Chancellor's Award for Diversity in 2009. Leland Wong is an illustrator, photographer, and screen printer renowned for his documentation of the Asian American experience. He lives in San Francisco. Sina Grace is a comic book artist and graphic novelist who lives in Los Angeles. Karen Tei Yamashita is the author of Through the Arc of the Rain Forest, Brazil-Maru, Tropic of Orange, Circle K Cycles, and Anime Wong, all published by Coffee House Press. 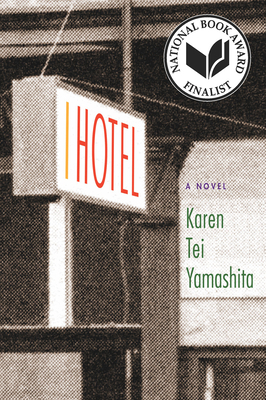 I Hotel was selected as a finalist for the National Book Award and awarded the California Book Award, the American Book Award, the Asian/Pacific American Librarians Association Award, and the Association for Asian American Studies Book Award. She has been a US Artists Ford Foundation Fellow and is currently Professor of Literature and Creative Writing and the co-holder of the University of California Presidential Chair for Feminist & Critical Race & Ethnic Studies at the University of California, Santa Cruz.